Emmanuel Macron is the largest political force in Europe today, but he is a force now hemmed in, constrained, trapped. The hurricane of his success last year – the defeat of the far-right, the assembly victory of his newly-minted party made him imperial in his power. That power now is much diminished, as is Europe itself. Yet though Mr Macron’s ambitions are curtailed and his power sapped, he has taught the world some useful lessons. The hurricane that was early Macron is now a wind blowing hard against him. His determination to supercharge a deep integration of the European Union has had nowhere to go for some months, and not just because the indispensable partner in the endeavour, Germany’s Chancellor Angela Merkel, is so weakened. Last week, the ‘Financial Times’ revealed a quarrel between Dutch Finance Minister Wopke Hoekstra and his French counterpart Bruno Le Maire – in which the French minister charged Mr Hoekstra with leading a group of small northern countries dubbed the “new Hanseatic League” in opposition to closer financial integration – with, apparently, the quiet approval of Germany. Mr Macron’s latest challenge has been a series of strong protests against a government-mandated increase in fuel prices. He has flatly defied the resistance so far. This in spite of the fact the demonstrators appear to have the support of a majority of French citizens, and both the populist right and left use the protests to build their bases. Ironically, Mr Macron’s largest success is to have illuminated two important hypocrisies. The European Union is committed to ever-closer union and movement towards what would be a European federal state. But, as the spat between the French and Dutch finance ministers showed, many of the rest of the EU’s states increasingly recoil from that future. At some point, the union must recognise that its official rhetoric is out of kilter with its members’ wishes – which are that sovereignty, especially in economic matters, remains with their governments. The more Mr Macron pushes, the clearer that becomes. The fuel protests also reveal a still larger hypocrisy – one that speaks directly to how we live now, and how our children and grandchildren will live. 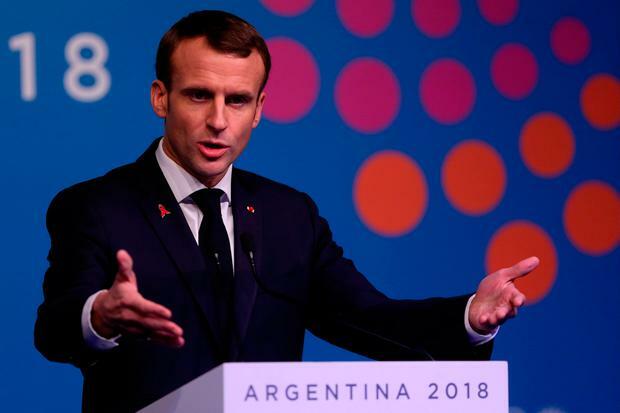 In an impassioned speech, the French president sought to reach out to the protesters, promised to take into account their anger and to change the way in which the government relates to them – but said he would not change course “because the policy direction is right and necessary”. This shines a harsh light on the disassociation between agreeing on what is good for our societies (crèches, schools) and for our world (saving the environment) on the one hand – and on the other, protecting our self-interest to the point of taking to the streets. Decisive action on carbon emissions at both official and personal levels falls into the hypocrisy trap. Even those who agree human conduct is the driver of global warming still want to drive gas-guzzling SUVs and are willing to march for low fuel prices. Mr Macron has not won his most ambitious aim, to re-energise the EU. He courts greater unpopularity by refusing to back down before the fuel protests. But he has taught a useful lesson: that high-sounding phrases and an apparent near-consensus which endorse ever-closer European union and ever-smaller carbon emissions are not serving their purpose.